Diada de Sant Jordi (Saint George's Day) 23/04/19. The streets and squares are filled with people strolling among the flower and book stalls. On 23rd April Catalans celebrate the day of their patron saint, Saint George (Sant Jordi in Catalan), a mysterious brave knight who saved a princess from being devoured by a ferocious dragon. The day has evolved into the popular day of the rose and the book. It is customary for men to give red roses to their beloved. The legend of Saint George has it that from the blood of the dragon a rose tree grew and that the knight picked a rose to give to the princess. There is documentary evidence of this tradition dating back to the 15thcentury, although at that time it was celebrated exclusively by the aristocracy. It has grown in popularity over the centuries to the point where today it can be stated that the diada is the real day of lovers in Catalonia. 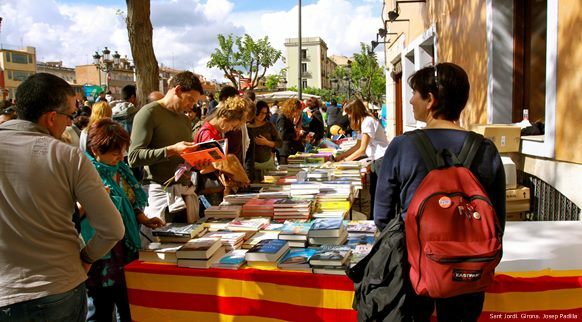 This tradition has been happily joined by the celebration of the Day of the Book, much more recent but also very firmly established in Catalonia. In this case, women traditionally give a book to their beloved. In 1995, this ritual was consolidated when UNESCO declared 23rd April to be "World Book and Copyright Day". Even though it normally falls on a working and school day, the Diada de Sant Jordi is declared a National Feast Day in Catalonia. The streets and squares are filled with people strolling among the flower and book stalls. Moreover, many balconies are bedecked with senyeres (Catalan flags), a reflection of the specific Catalan nature of this very special day.